We´d like to introduce to you the initiative started by our Organization with the goal of preserving our rich and diverse Natural Heritage. Our journey started already twenty three seasons ago (Winter of 1990). Through these years, our Project has been growing slowly but constantly and nowadays it is in a highly developed stage. Our initiative, known as PROYECTO FORESTAL IBÉRICO (IBERIAN FORESTRY PROJECT), has as its final goal the preservation of the natural vegetation cover. We understand that the greatest ecological problem that the Iberian Peninsula faces nowadays is the destruction of native Iberian woodlands and scrubs through indiscriminate felling, plantations of both fast growing and exotic species, landscape transformation for agricultural uses and forest fires and the desertification that arises from them. The development of woodland restoration and recovery activities acquires a vital importance nowadays. This implies the use of species that belong to the Iberian forest flora which, generally, are not produced in the bigger wholesale nurseries. This is especially true for some types of bushes and trees which are not of great interest for the industrial forestry. By means of our catalogue, which you can download from this same web page, we would like to inform you about the species produced in our Forest Nurseries and that will be available to you from October-November 2013. Shade intolerant and hardy species, the IBERIAN POPLAR OR BLACK POPLAR (Populus nigra susbp. 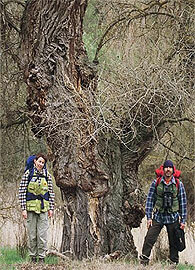 nigra) is possibly the most extinction-threatened tree.